This will be my fourth year at the retreat, and this is the biggest group yet! We have pretty much taken over the whole camp. It’s a very diverse atmosphere; there are several families here, and lots of couples, too–people of all ages. I’m not a BOGA member (my husband is), but I find the group to be very welcoming and fun. The retreat is always a great time to just relax, so I also brought some books and cross stitch with me for when I need to indulge my introvert nature. I also brought my laptop (again, as evidenced by this post), so I can do blogging or scrapbooking as well. I’ll also be playing some SWTOR, so it’s really great that the game is having double XP weekends right now (until April 8) in anticipation of the Rise of the Hutt Cartel expansion. I just started a new Jedi character, so double XP is great for helping get me off Tython and Coruscant as fast as possible. 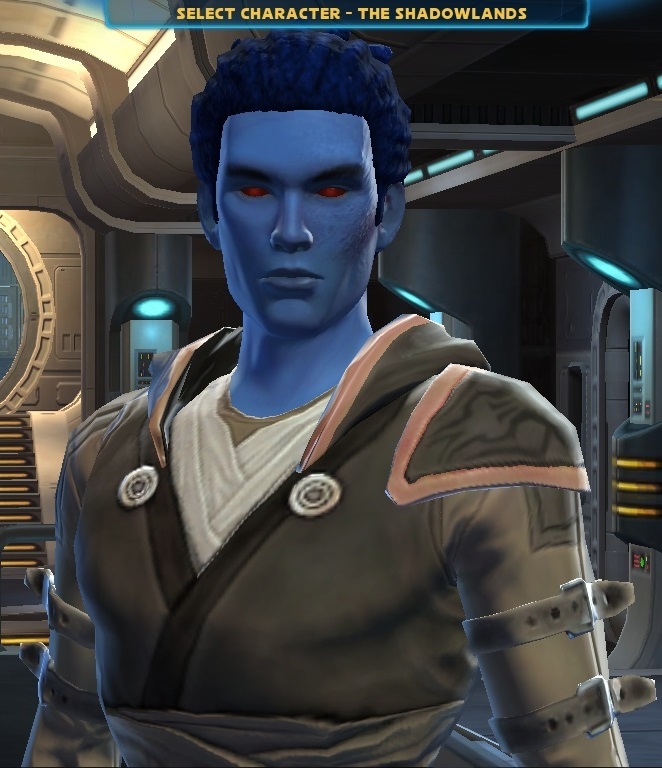 Now that I have a Chiss global unlock from getting my bounty hunter Sind’onin to lvl 50, I thought it would be cool to have a Chiss Jedi…so I created the bounty hunter’s son, Tsor’onin. He’s a Knight, and (a lot like his mom) he’s very physical and is always looking for a challenge. He’s not always tactful but does have respect for those he considers his equals (or betters). He’s married to my other Jedi character, the Twi’lek Sortisi. Obviously they met at the Jedi Academy on Tython, and they probably had some adventures together also. Her level-headedness and kind compassion keep him on the light side. He also respects her intelligence. I think Sind’onin gave her kid to the Jedi to train (instead of the Sith) because she really has no allegiance to either government, and she simply thought he would get the best training with the Jedi. Also, you’ll notice from the picture that I play on the PvE Shadowlands server. Stop by and say hi!